It’s a long time since I mentioned this subject but we do need to talk about this. Really. Do you shower before swimming in an (indoor)? If not, why not? Do you pee in the pool? In two UK and US studies, 1 in 5 adults admitted they have and in the UK study 70% don’t shower beforehand. Amongst general swimmers we can be certain the peeing figure is much higher whereas with elite swimmers the figure is almost 100%. I was reading a swimming forum discussion about this subject, which asked the number of people who showered before swimming. No firm percentage was gathered but it was the majority who didn’t clean before a swim. 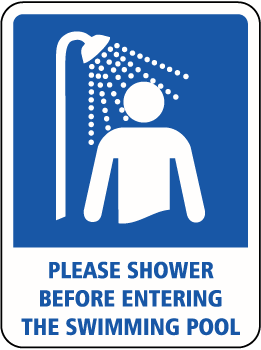 Many swimmers admitted to never showering beforehand. Some said entire swim squads never showered and their coaches never enforced the rule. It was both interesting and disquieting with the general lack of misunderstanding about the essential role of pre-swim showering for everyone. An example: Even when we have dry land training first and are quite sweaty my whole team just jumps in the pool. Doesn’t bother me. No evidence of any awareness by swimmers or coach there. That was in fact the most popular comment. It was repeatedly indicated that showering before using the pool was less common in the US than many other countries. I can’t put hard figures on that though since the forum is populated predominantly by American swimmers. Showering before using the pool is common (but nowhere near universal) behaviour in Irish pools. But only yesterday I was doing a 10k swim and twice during it I could taste perfume and deodorant in the water after two different people entered at different times. Even lifeguards don’t all know the reasons why showering is important. A small minority of people did say it was courtesy to other pool users to shower before swimming. A not-quite-as-small amount indicated that more people not showering required more work by the pool to balance the chemical load to get the filtration system to work properly/optimally, particularly having to increase chlorine. Both these items are true but secondary to the main issue. First you have to ask yourself; why is chlorine added to water? You all know: to kill communicable pathogens (particularly bacterial or parasitic). But it doesn’t kill everything. Cryptosporidium, which many have heard about from news stories of infected municipal and domestic water supplies, can live for days in chlorine. Sweat, soap, perfume, shampoo, conditioner, aftershave, deodorant, urine, faeces are all organic compounds which contain proteins. When organic compounds are introduced into a chlorinated (or brominated) environment like a swimming pool, disinfected by-products are produced. While the chlorine is intended to neutralise harmful pathogens specifically from faeces (urine is sterile) it also has undesirable side effects. Chlorine reacts with the organics to create gases whose family are called Trihalomethanes (THMs). It reacts with proteins to form Chloramines which include Nitrogen Trichloride. Trihalomethanes are colourless odourless heavy toxic gases. Chloramines are nitrogen chloride gases which display the strong chlorine smell people associated with the smell of chlorine in pools (and not actually indicative of such) and also toxic. The extent of these gases produced is a function of the amount of organic matter entering the water: The more organic matter the greater the gaseous concentration AND a subsequent prerequisite increase in the amount of chlorine that must be added to the pool to keep it balanced. The risk of asthma is especially increased among competitive swimmers, of which 36% to 79% show bronchial hyperresponsiveness to methacholine or histamine (1). THMs lie in a thin layer on the water just where most commonly you and I are breathing, which is how people absorb the majority of them. About a third is also absorbed through skin, and some by swallowing. There’s no way of avoiding them if they are present. The more organics brought into, or urinated into the pool, the worse the health situation. A greater chlorine smell in a pool hall means the worse the pool chemical balance, not cleaner water. You should be showering before entering a pool. Regardless of if you have showered already that day. You should be showering after using a sauna before entering a pool. 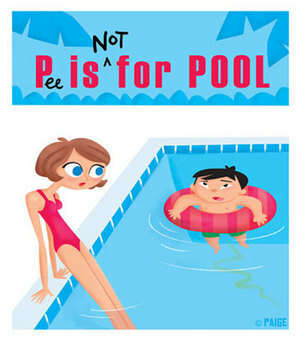 You should not be peeing in the pool. If your pool doesn’t encourage showering, why not write a simple letter to them explaining that by doing so they reduce their chemical costs (by up to 50%). If your friends and fellow pool users don’t do so, your example and encouragement is even more important. Distribution and determinants of trihalomethane concentrations in indoor swimming pools. Nitrates, chlorates and trihalomethanes in swimming pool water. (American Journal of Public Health). Pathways of trihalomethane uptake in swimming pools (Science Direct). Our mobile home park has rules re showering and babies in diapers but people ignore the rules. Disgusting. There is one woman who rides her bike, gets all sweaty and then jumps in the pool to cool off. I cringe when I see her coming and get out of the pool. What the heck is wrong witn people? Last week there were two babies in pool in diapers! I read this with amazement, I am a pool manager for a council in Australia, I have always had the compulsory shower rule but lately we have had so many complaints about having to shower before swimming that I now have to explain to the powers to be why we should keep the shower rule in place, how sad it is to be surround by those that complain that their right to not shower is being questioned. Thanks Kevin. What shocks me is that most pools here don’t even insist on showering before and many, like my own, no longer even have a notification up to so do. Waimakariri Aquatic Facilities in New Zealand doesn’t think showering should be a rule – they say they filter the water so well it’s not needed. I have seen a lifeguard in my pool send a dry swimmer back into the locker room to shower before lap swim. This makes me feel better about the pool hygiene even if I know it can’t be perfect. I can remember that kind of thing happening when I was young, but I haven’t seen it in many years. Would a carwash style compulsory walk-through shower area be a breach of human rights? 🙂 Hate that aftershave taste in a pool. And I’m not a scientist but I know that taking in air from the surface of a pool as I swim isn’t doing my VO2max any favours for all my cardio effort. Roll on summer. i am appalled by the majority of swimmers in my local pool who deem it unnecessary to shower. Its disgusting! The changing area / showers are a walk through from outside and we don’t have foot baths either so basically people traipse through dirt and then get straight in the pool – lovely – thanks for that. I wrote a letter to the GM expressing how i felt and the reply was that simply it was impossible to enforce – the notices about showering were a request and it was up to the individual whether or not they wanted to comply! give me a river any day of the week……! Thanks for this. I always make a point of showering before I go in the pool, but I notice lots of people who don’t. I am usually swimming when the local swimming team are training, teenagers most of them, not many of them shower before hitting the water and the coach never says anything. I usually do 50 lengths, get out and go to the toilet, then shower and go back in again for another 50. I always making sure I wash my feet carefully because the toilets are not particularly clean. I have heard comments from other swimmers wondering why I was getting out and then back in again which really bothers me. Am I swimming through their pee? Thanks Jen Louise. I can almost certainly say that you are, sorry. The best approach is to convince the pool that their staff and customers will be healthier and their running costs will be lower if they introduce a shower before regime and get the lifeguards to reinforce it. This is a great practical article! Totally agree and reblogged. Thanks for posting this. Loneswimmer sums this one up nicely. I can’t express how hacked off I get when people don’t shower before swimming. I hate swimming through other people’s perfume and aftershave, and on the rare occasions when my asthma has kicked off when swimming, there’s been a very strong odour of chlorine. Shower before you swim!! And don’t pee in the pool – get out and use the loo! I’m with everyone else, it’s amazing that this needs to be written. Out of curiosity, how does sweat effect the chemical balance? When the pool is hot, I have lost as much as 4 lbs of water weight from sweat and us much as 3 lbs when the pool is at a lower temperature (I have adjusted my hydration rates accordingly). I wrote this earlier in the week but spoke with a few lifeguards and a pool manager over the course of the week. The lifeguards were miscellaneously aware of not of the reasons, depending on their experience. The estimate was that left without any intervention the numbers showering would drop to about 20%. And that’s where where I was under the long-term impression that it part of pool culture. The most experienced put the increase in chemical use as the most important reason. Not one knew about THMs though that said my friend Clare who started me on all this nonsense and manages a different pool is completely aware and has trained her staff appropriately. Sweat would of course have the same effect, it’s one the things you are trying to get rinsed off in the pre-shower, and why it’s important for people coming out of a sauna to shower, because they are sweating heavily. But most people can’t swim well enough to work one enough so it would depend of the number of swimmers, and the pool temperature I guess. Okay. That’s disgusting. I despair that this needs to be said. I will add those stats to the long list of things I am in denial about when I go swimming. People are undeniably disgusting. I’ve seen forum discussions where swimmers are talking about peeing in the water and telling the person in the lane beside them at the same time, just to put the other person off. Another reason why, though most of my training is in the pool, I only consider myself an open water swimmer. Amazing that a piece even needs to be written about this subject! New blog on one of my swim hobbies Jack?